A colourful and buzzing atmosphere filled the Bloubos valley and spruit area, south of Johannesburg on Saturday when Miss Earth South Africa semi finalists spent the morning with around 150 Generation Earth students from across Gauteng, families and friends who came out and spent the morning in the winter sun. 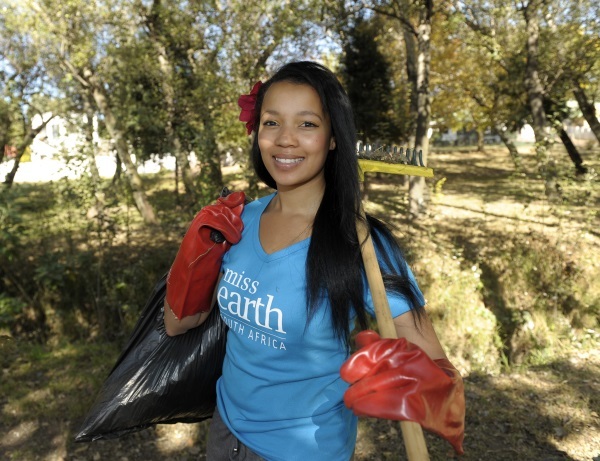 In honour of National Environment Week which will be celebrated in just less than a week (1–7 June) and World Environment Day (WED), which takes place on 5 June, the Miss Earth South Africa semi finalists across SA have embarked on community clean up initiatives. The first of these took place this past weekend where clean up’s happened in Johannesburg, Port Elizabeth and Bloemfontein. Semi finalists have been working in their communities over the past six weeks focussing their efforts on community food gardens, and awareness around the important issue of food security. The organisation has had a very focussed programme over the past five years looking at food insecurity as a critical issue facing not only South Africa, but Africa at large. Additionally it has created fun and exciting ways for learners in a classroom environment to understand and appreciate, the benefits of planting their own food, and also the changing climate that we live in and the challenges that they face. In the coming month semi finalists will run with tree plantings in the schools they are working with across the nation. In mid June, the national finalists will be selected ahead of the gala announcement of Miss Earth South Africa 2014 which will take place at a Tsogo Sun venue, in August. This year’s ambassador will represent South Africa at the international Miss Earth. The Miss Earth South Africa organisation has a long-standing tradition of energy efficiency campaigns, food gardens, clean up activations, alien invasive removals, water and waste management programmes, tree plantings and more. Social community upliftment projects such as a stationery drive, collection of toiletries and care packs for patients at various hospitals, blanket, clothing and non-perishable collection campaigns also form, part of the extensive calendar for the year, as the organisation believes and strives for a balance between social-economic and environmental sustainability issues. In 2013 the executive director Catherine Constantinides and her team spent World Environment Day in West Africa as they launched the Miss Earth Cote d’Ivoire campaign Ambassadrice Earth Côte d’Ivoire and engaged with community members, Ministers and Government officials. Their time in the region saw them work extensively in fishing villages and communities outside of Abidjan. The collaboration between the two countries was born of a common goal of sustainability, education and empowerment. Their time there included tree plantings, beach clean ups, climate change and science lectures to students of the local university, Abidjan Cocody. They also initiated greening programmes at the local schools in the fishing village as well as extensive engagement on sustainable fishing methods, health and sanitation with community leaders. Partners involved in the 2014 campaign include Tsogo Sun, IMPERIAL Toyota, SAPPI and Reliance Compost; through which the Miss Earth South Africa is proudly carbon neutral.